A younger Derby selection ran out against a Broadstreet side having re-established itself after relegation from the higher professional league. Callum Slater teamed up with Jack Dawson in the centre and Jake Roome took over at scrum half. Overall Broadstreet proved very “Streetwise” (excuse the pun). Their ball possession, power and pace proved decisive against a spirited and valiant Derby defence. Derby’s high energy efforts were offset by too many unforced and handling errors – very frustrating. However, it was Derby who exerted the early pressure and George Castledine kicked a penalty. From a 5-metre scrum Dale Glover scored a try to give the visitors the lead but Castledine kicked another penalty to restore Derby’s lead before Josh Tizard replaced the injured McGrath Van Wyke at Full Back. After four phases, prop, Dodd, touched down for a try and after a Yellow Card for Luke Willmott, No.8 Daynes exploited the man advantage to cross for a try. Both were converted by Glover giving Broadstreet a thirteen points lead at the end of a 48-minute half. After the restart, though a man short, Derby exerted great pressure for the first fifteen minutes but without a score. 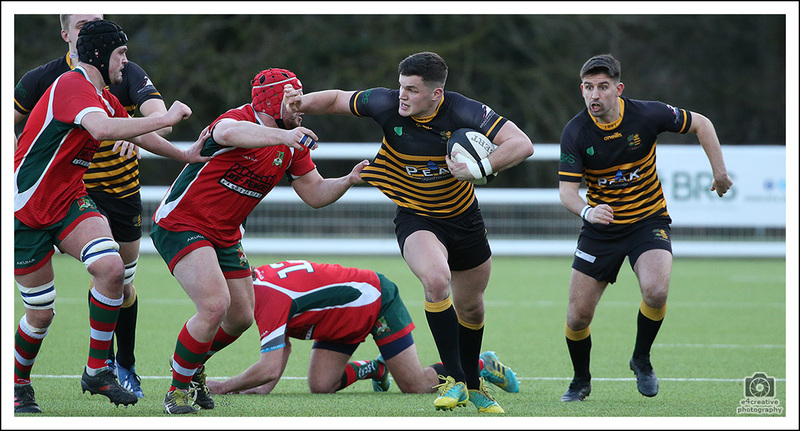 In contrast, once the Visitors exerted pressure, they scored with tries from Dodd, scrum half, Easton and winger, Cregg following an intercept. Glover converted two of them to give his side an unassailable lead of thirty two points. Sam Herrington replaced Charlie Barker and Dan Hyams replaced Simon Moon. The latter had to return when Ryan Manning injured his shoulder. Refusing to give up, Derby fought back and Luke Willmott scored an unconverted try. Minutes later Jake Roome broke through from a scrum for George Castledine to convert. During this period Derby looked threatening with Dawson and Slater breaking the defence line but in extra time wing forward, Munro, scored the final try converted by Dale Glover to bring the game to a very disappointing end. The remaining games will be relegation dog fights but with hope and a fighting spirit, Derby could still survive. It is Burton away next Friday night.